China has long wanted to replace the U.S. dollar as the world reserve and trade currency, and efforts are being made in Beijing to set up the Chinese yuan for that ambitious purpose. Just three years ago, the governor of China's central bank wrote a proposal for the creation of a global currency, one single monetary unit that could be used to buy and sell worldwide. Central bank officials hope to have the yuan more easily convertible and ready to use for its own international trade by 2014. The U.S. dollar dropped to 1.3208 per euro Thursday after it was announced that first-time unemployment benefits claims had risen to 380,000, shooting up by 13,000 last week. Corresponding to the fall of the dollar, gold is climbing back up toward $1700 per ounce (up from $700 per ounce just five years ago). The Federal Reserve anticipates that interest rates will stay low for some time to come, and the U.S. economy is still "quite fragile" according to Eric Viloria, senior currency strategist at Forex.com. In the meanwhile, China is pushing toward its goal of pushing the U.S. dollar out of its king-of-the-mountain spot as the dominant world currency. In 2009, Governor Zhou Xiaochuan of China's central bank suggested that the world's financial situation would be improved by moving toward a "super-sovereign reserve currency." 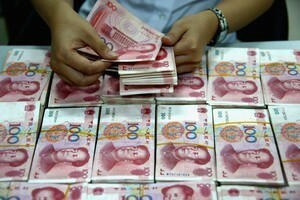 The yuan is in no position to take that job, but China may be working to make it a possible contender in the future. Considering China's size and the extent of its trade, an effort to internationalize the yuan is not unexpected. Right now, China's central bank is working to improve the convertibility of the yuan so that it can be used instead of dollars to settle payments on Chinese goods. While the yuan may not take over the dollar anytime soon, it will lighten some of the demand for the dollar in international trade. "The new system will link domestic and overseas participants directly, and support different languages including Chinese and English. What's more, the working hours will be extended to 17 or 18 from the current eight to nine hours to cover yuan settlement demand from different time zones," said Li Yue, director of the payment and settlement department at the People's Bank of China, according to China Daily. For several years, China promoted the idea of a single global currency under the IMF. This currency would mean the end to national economic sovereignty. A super-sovereign reserve currency, however, would promise to be a headache for member countries. The European Central Bank suffers over making policy for just its 17 member nations. Europe has struggled to get through the Greek debt quagmire, and while Italy managed to sell nearly 2 billion euros worth of bonds at an auction this week in the effort to clean up its debt, the interest rates on three-year bonds jumped up as a reminder that investors are not completely confident the country can manage its debt. Moving to the euro has not been all crepes and sausages. A central bank managing the economies of the entire world would prove a bureaucratic nightmare. Plus, it would be difficult, if not impossible, to find truly neutral parties to run the exceedingly powerful IMF at that point. As the dollar value drops compared to other currencies, like the euro or the Swiss franc, it means that foreign imports will cost more to U.S. consumers, hopefully encouraging Americans to purchase more items "made in America." It also means that U.S. exports will cost less to foreign buyers, narrowing the enormous U.S. trade deficit. If U.S. companies can sell more goods to foreign markets, that could potentially mean the creation of more jobs in the U.S. (Though China, with its artificially low currency, will remain a rough competitor). At the same time, a falling dollar equals a loss of purchasing power for Americans and for those holding U.S. dollars. German cars and Japanese electronics become more expensive for Americans to buy. Dollars buy fewer goods and services while employers remain reluctant to increase paycheck amounts. The costs of building American-made products increase, and the cost of food promises to rise. As the prices of imports climb, American companies may take advantage of the weak competition to push up the prices on domestic products. In the investment world, the weak dollar also can cause problems in the long run. Foreign investors are less likely to invest in U.S. stocks because their value might go down over time, which in turn means less capital for young or expanding businesses. Investment creates jobs and provides the money to purchase goods and services that get the economy wheels turning, yet a weak economy and low interest rates provide investors a poor return on their weakening dollars. As bond prices fall, interest rates eventually push back up so that investors can make up for the loss in earnings. While a super sovereign currency is not yet sparkling on the horizon, China still has high hopes for the yuan. China's ability to internationalize the yuan would give it another way to compete with the United States and would give another shove to the already shaky U.S. dollar.